Each spring, during the last week of April, we take to the woods to gather Wild Leeks (Allium tricoccum, also called Ramps). We cook them along with Dandelion greens, dried nettles, and Maine coast sea vegetables. Then these are hand chopped and mixed together with Hearty Brown Rice Miso (already aged for two years) and Sweet Tasting Brown Rice Miso (already aged for three months). This mixture is then aged for one full summer. 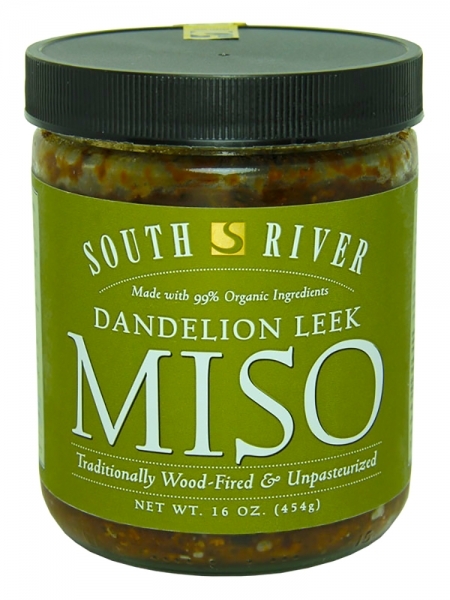 This miso is great for an instant soup broth in the workplace or for a "pick-me-up" instead of coffee. One friend even gave Dandelion Leek Miso as a gift to the Empress of Japan. Deep well water, organic soybeans, organic brown rice, sun-dried sea salt, dandelion greens, wild leeks*, nettle greens, organic sea vegetables, and koji culture. *Wild crafted. - No gluten ingredients.